Aster Dwarf Milady Lilac Callistephus Chinensis is a popular, low-growing annual plant. Aster Milady seeds are easy to grow, and they germinate quickly. This dwarf aster grows only 10 inches tall and blooms profusely with showy, large, double-flowered, lilac flowers. Aster Milady blooms for months all summer and fall long until frost, and its charming, fragrant flowers attract butterflies and bees. 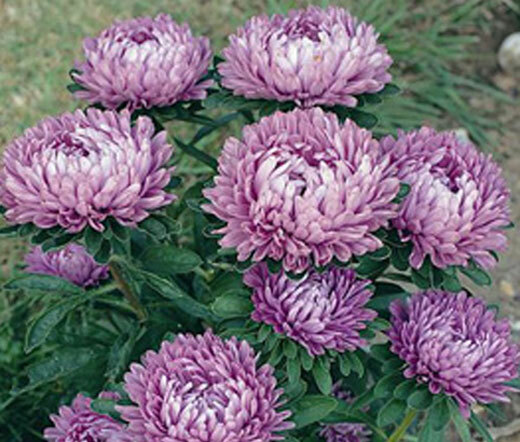 Aster Milady Lilac has a compact growth habit and looks nice in containers, pots, and window boxes. China Aster is also an outstanding border and bedding plant. Callistephus Chinensis grows best in full sun or partial shade and tolerates drought and heat perfectly if the soil is kept moist, but well drained. Dwarf Lilac Aster is a nice cut flower with a long vase life.